Upgrade your pantry and health habits with a spring refresh. The change of season and warmer temperatures inspires us to lighten things up. We want to throw open the windows, shed winter layers, and reclaim a little order in our daily routine. Channeling this inspiration to organize your kitchen pantry will not only promote a sense of calm and better efficiency, it can actually encourage healthier behavior. Setting up your environment to support healthy habits is time and effort well spent. Spring is the perfect time to refocus on our health, so we’re sharing five tips on how to give your pantry a wellness makeover. · Canned products –beans, tomato paste, coconut milk, etc. · Jars – sauces, jams, etc. · Breakfast food – cereal, oats, etc. · If you have kitchen equipment you no longer use, think about selling or donating to create more usable space. The right storage containers can help make items easier to find, thus saving time. Anything that helps make the shopping, storing, and cooking process more efficient is a big win in our book, especially when it beautifies the space. Mason jars are perfect for storing grains, nuts, seeds, flours and more. They’re affordable and widely available, but any clear container with an airtight lid will work well. Make sure to label and date your jars or containers so you can distinguish between items that have a similar appearance. I also like to add cooking instructions to the label, if applicable. Turntables and stackable shelves can help you maximize space. Baskets and bins are a great way to store bulkier items like snack foods or pasta boxes. 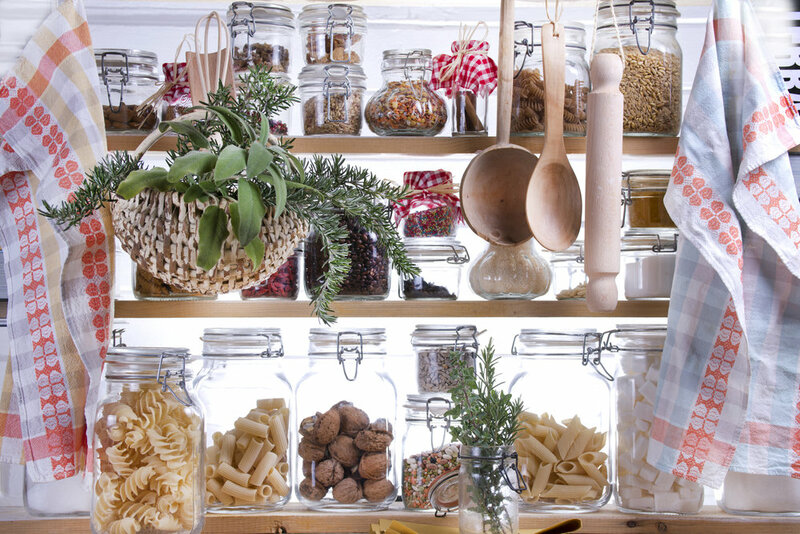 Consistent jars, baskets, or bins help your pantry appear more uniform and tidy. · Reusable containers for healthy eating on the go. I love stasher bags, glass containers, and reusable flatware. · Arrange items by category—you can sort by meal (breakfast, lunch, dinner) or by food type (baking, grains and pasta, legumes and beans, etc.). Think about what will work best for your space and household. · Store healthy food at eye level. o From a design standpoint, it looks more appealing to have your healthy food in mason jars or uniform containers in direct view on middle shelves, with packaged goods on the top or bottom shelves. · Place snack food in large bins on the top or bottom shelves. · If you store kitchen equipment (mixer, juicer, Crockpot, etc.) in your pantry, sort by what you use most frequently. If you only bake from time to time, your mixer can take a backseat. We want to see how these tips work for you. Tag @ascendcycle or #howiascend and show us your spring pantry makeovers!